We were lucky to become involved with this special breed when we purchased our first bulldog in 1986 - KralanVincent's "Lil Hallie". She produced 10 champions making her a Beckett Award winner and putting Joel into the Hall Of Fame. He is now a recognized Breeder of Merit by AKC. Last year JWilson's Everybody Dance Now "Lindy" was Best of Breed at the 2018 BCA Nationals in Minneapolis, Minnesota. She is a Silver level Grand Champion and has tested clear for both HUU and cystinuria. We now have 24 home bred Champions including Wilson-Dixon's WD40 - "Slick" and JWilson's Wise Guy "Guy". Slick was a Silver Level Grand Chanpion, a Platinum Level Health Ambassador and HUU clear. 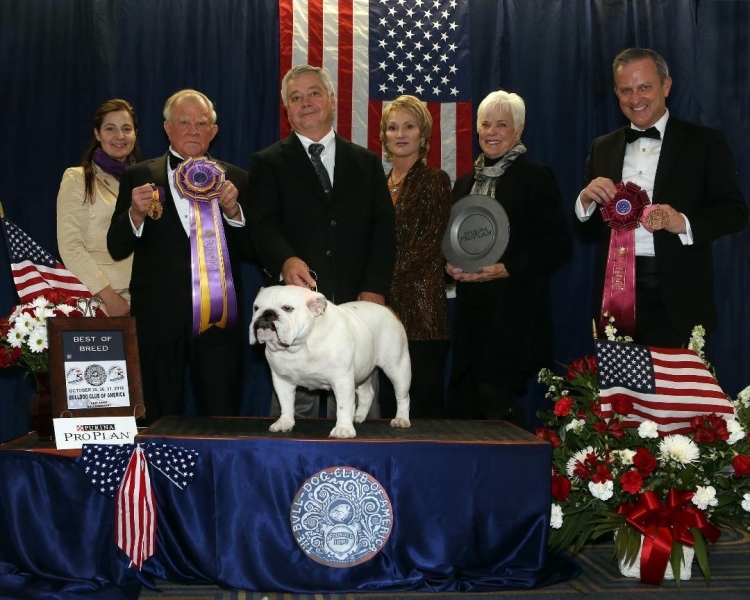 He also has multiple Best in Specialty Show wins and is sire of Wilsons I'M Your Handyman "Decker" the number one Bulldog and winner of the BCA Nationals in 2015. Guy is also a Grand Champion and also HUU clear. He was chosen Select Dog at Nationals in 2016. We are members of the Bulldog Club Of America and the Oklahoma City Bulldog Club . We continue to breed for quality in health, temperament and conformation.